Dahlia Mahmood, one of the most widely recognized celebrity interior designers in the world, spend her early years in southern California, steps away from Disneyland, that she and her family frequented. The world-famous amusement park inspired and fascinated young Dahlia. “If Walt Disney could create something that is so unique and is appreciated by both adults and children from around the world, then why can’t I elicit those same feelings?” she asked herself. She would watch the fireworks and dream of one day becoming someone important. At the tender age of five she announced, “Mom, be prepared. I am going to be a famous designer!” At seventeen she took on her first design project. Today Dahlia is a wildly successful businesswoman, known for her extraordinary architecture, landscapes, and interior designs. Her talents and tenacity are legendary. Her unmistakable signature style of simplicity and elegance won her awards and accolades around the globe. Her mission is to create timeless, highly sophisticated interiors, featuring top quality materials and consummate craftsmanship. Her vision centers around combining classic design with the personalized touches of luxury. Her passion is to create understated glamour in everyday living, to seamlessly fuse comfort with luxury. She was selected as a featured designer by the prestigious Haute Design Network for her outstanding work in the field. Why did you decide to become a designer? If you weren’t a designer, what would you be and why? I knew at a very young age that I appreciated aesthetics. Everything surrounding me needed to be arranged just so. Even when I played with my Barbies, I would rearrange the dollhouse to look perfect. When I was a child, my mother would do my hair every morning before school. If one hair was out of place or the bow was crooked, I would be so bothered that I would refuse to go to school until it was perfect. I was an intense child, but truthfully, it was those details that I cared about so much that brought me the success I have today. If I was not a designer, I would be a humanitarian. I love public service and receive immense pleasure when I can relieve suffering or make someone’s day in any way. My ultimate goal is to improve the lives of others, whether by design or any other means. What is your greatest strength as a designer? Biggest weakness? My greatest strengths as a designer are my acute attention to detail and my desire to always exceed my client’s expectations. I am a master at mixing different textiles and colors, which enables my designs to constantly evolve and always excites and enchants my clients. My biggest weakness is that I tend to overwork myself. It is very hard for me to say no to my clients. When my creativity is flowing, I can’t rest until I’ve created my masterpiece! My proudest achievement was designing my first museum for King Abdullah of Saudi Arabia in Fairfax, VA. It was an enormous responsibility to bring the spirit of a visionary leader to life. I was truly honored to have been entrusted with the task of representing the King’s legacy in such a large scale visual exposition. I was given four weeks to complete the design, but I was so inspired that I had it fully mapped out in my mind in two days. We used a variety of advanced technological mediums including the latest indoor mist dispersion technology. I hope this museum will just be the bedrock to many more interesting and challenging experiences in my career as an interior designer. What is your favorite word or saying? I love to travel! Visiting different countries and diving into foreign cultures continuously expands my creativity and influences my work. I love seeing different forms of architecture, colors, and styles and incorporating ideas from around the world. Fashion is also a big inspiration as it is always evolving in form and style, and that is how I want my brand to be. My husband, Mounsif Tolab, and my three boys: Kayden, Saif, and Jad. They are the loves of my life! What song or lyric best sums you up? Which one of the five senses is your strongest? I believe my sight is my strongest senses because I can spot things from a thousand miles away and am always noticing the minutia around me. My children are my biggest motivation. I do what I do for them. They give me the drive to work hard and be a good role model. Their endless love and support keep me grounded and allow me to be what I am today. What does the concept of “luxury” mean to you? Luxury is a limitless indulgence of the best things in life. It is all about expectation, uniqueness, and simply feeling good. Luxury affects all the senses and makes you feel something special. You can taste, touch, smell, see, and hear it. What is your definition of “quality”? Quality is synonymous with luxury. It is something that can stand the test of time. I would rather have a few things of quality than many things of poor caliber. What is the single most important thing you want people to notice in your designs? The most important thing I want people to notice is the simple elegance in the details of my designs. I put my heart and soul into my work and I want my clients to feel that when they walk into a Dahlia Design room. What is the best comment made about your work and by whom? What advice would you give to young starting professionals in your field? I strongly suggest developing a strong work ethic. It is wrong to assume that just because you now have a degree, you are entitled to a job and a career. You need to be prepared to work hard and go above and beyond if you want to succeed in this business and in all things in your future. Success will not be given to you freely, but when you achieve it, it is worth all of the struggle. There is no stopping Dahlia. 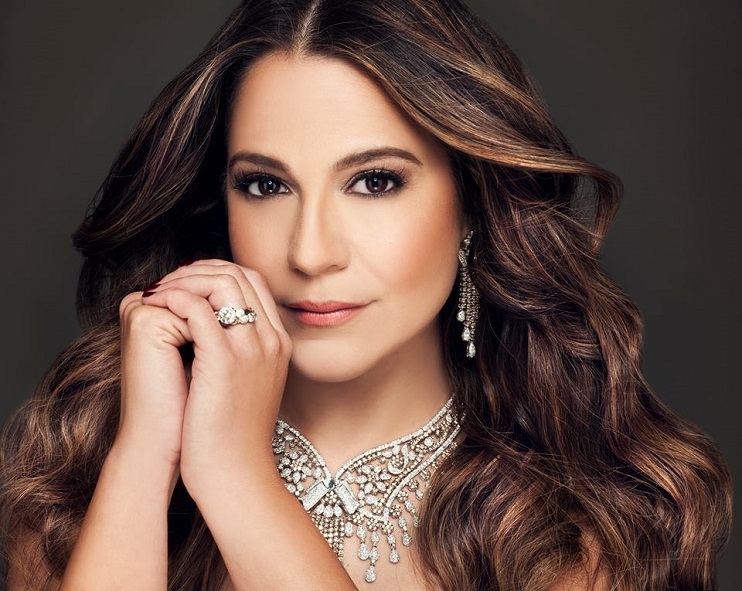 She is constantly working on her business expansion and recently launched “Dahlia Design Lifestyle”, aimed to service her customers post-project and maintain her signature luxury stamp on clients’ daily lives. Her long-term goal is to venture into designing a variety of household goods to offer everyone an opportunity to experience the Dahlia Design. Under Dahlia’s fierce leadership her company is poised to become a global empire. As a human being, she is a source of inspiration to us all. As a woman of an Arab-American descent she is showing the world how to overcome any and all odds by pure determination, hard work and giving it your all. That’s worth celebrating. Home decorating budgets are often quickly spent on the interior, with nary a penny left for decks, patios and back yards. One often-overlooked piece worth investing in is a pot or planter. Debra Prinzing, a garden expert based in Seattle and author of the book “Slow Flowers,” says that when shopping for planters, think big. ● If the pot doesn’t have enough drainage holes, drill a few more. The kind of drill bit you need will depend on the material of the pot (for instance, a masonry bit for a ceramic pot). ● Invest in organic potting soil. ● Make sure to check about proper care; pots made of certain materials might need to be taken inside during the winter. ●Got all that? Now check out some of our favorite planters. ● “Window-box planters are more popular on the West Coast,” Mahmood says. “On the East Coast, I see more hanging planters.” For window boxes, Mahmood recommends the California garden store Hooks & Lattice. 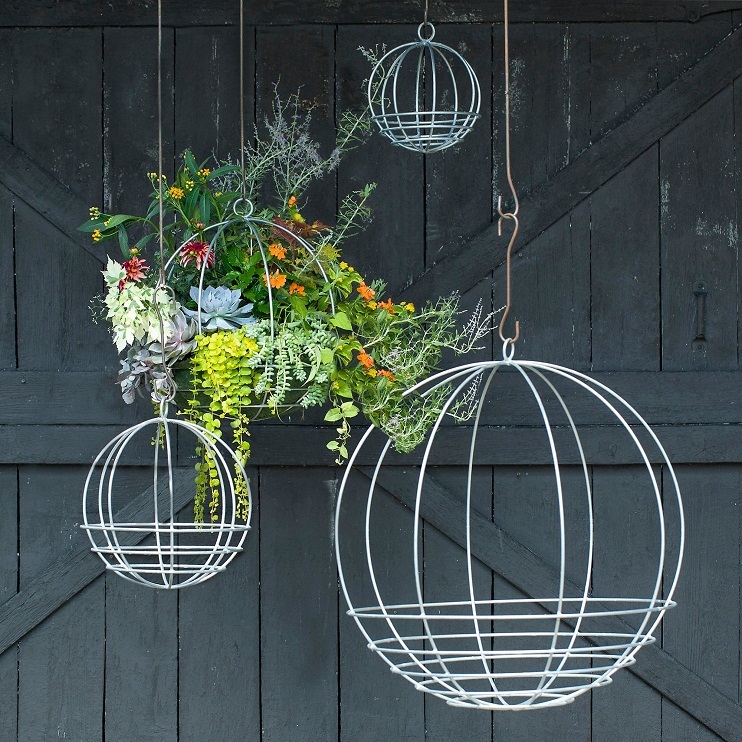 For a hanging planter design that lets the plants shine, there’s the minimal Zinc Sphere Hanging Basket ($38-$148, www.shopterrain.com). ● Prinzing recommends checking with the seller about ideal weather conditions for planters before buying. The ceramic Case Study Planter with Walnut Stand, for example, should be taken indoors during winter to prevent freezing and cracking ($149-$189, www.roomandboard.com). Terra cotta also should be brought inside before the first frost. ● A pot’s style should complement the house and garden. Mahmood says that concrete and cast stone are good for traditional styles, terra cotta for a more earthy feel. The Colorful Steel Garden Trolley Planter would fit nicely on a patio with a modern style ($200, www.plowhearth.com). ● The Dolga Hover Dish is sold by Vancouver company Pot Inc., one of Prinzing’s favorite sources for great containers ($95, www.potinc.ca). Some of her other favorite retailers: Flora Grubb Gardens in San Francisco, Potted in Los Angeles and Sprout Home in New York. Mahmood likes to look at Jamali Garden in New York, Janus et Cie in the District and Restoration Hardware. ● If you have room for only one planter, use it as an opportunity for an architectural statement, Mahmood says. “Keep it simple, elegant and timeless,” she says. “You will not go wrong.” See: the sleek lines of West Elm’s resin-composite Cityscape Planters in multiple sizes and neutral colors ($119-$299, www.westelm.com). 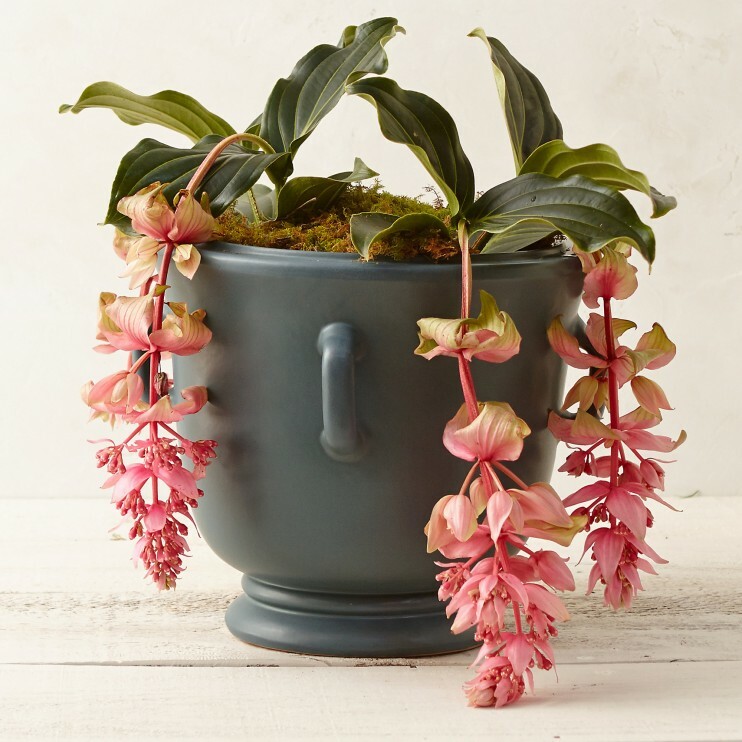 ● The zinc-plated galvanized steel Malmesbury Planter, in three sizes, is reminiscent of English country gardens, making it a ripe location for herbs or even a small boxwood, which Mahmood likes to use in all of her projects ($70-$100, www.williams-sonoma.com). “Whether they’re in an urn, metal planter or resin wicker, they always looks classic,” she says. ● Look up from the ground when you’re thinking of locations for placing greenery, especially if you’re tight on space. 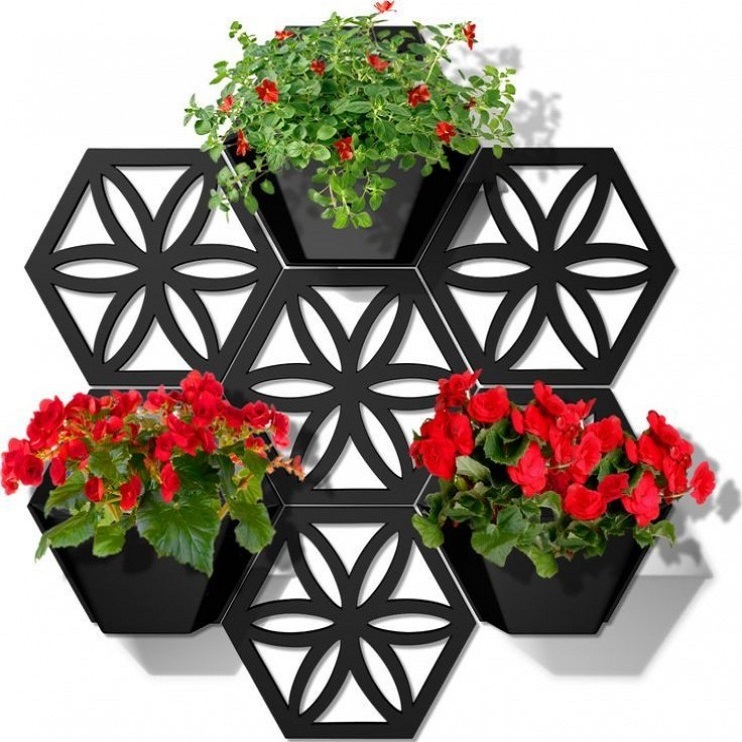 There is now an abundance of planters for overhead surfaces and walls: vertical plant stands, hanging plants, single wall pots and wall planters, such as Plastec’s Wall Planter, a three-pot decorative grid that you can add to with expansion kits ($50,www.allmodern.com). ● To narrow down the planter search, Mahmood suggests homeowners ask themselves: Is it aesthetically pleasing? Will I still love it five years from now? Is it made of quality material? Two Quatrefoil Square Planters, made of a mix of fiberglass resin, terra cotta and natural stone, would frame a front door nicely and last a long time with proper care ($69-$169,www.homedecorators.com). By: CLOVER STROUD | March 28, 2015 | The Spectator When Lewis Carroll created Alice’s wonderland, he sent his diminutive heroine down rabbit holes and through looking glasses and in doing so created an imaginative kingdom that has lived in the mind’s eye of adults as much as children for 150 years. He captured the imagination of generations, because escaping into a world of fantasy is what most children want to do. My children’s excitement was unbridled when I bought them a secondhand set of bunk beds for the princely sum of £70. They transformed them into a den, using some cleverly draped blankets and a few butterfly stickers. Their bedroom door remained locked during this process, and I didn’t mind being shut out, letting them escape from my demands that they brush their hair, do their homework and pick up their clothes, since I know that leaving them to their own devices is the best way to encourage their creativity. I don’t have a fortune to spend on my children, but if I did, the ‘den’ that might have been created could have been very different. Because today’s commercially astute interior designers and construction engineers have become inspired by the idea of bringing imaginary worlds to life. There is a rapidly growing market in fantastical bedrooms, playrooms and playhouses for children. It is led, inevitably, from LA, where every other child probably sleeps in a pumpkin carriage bed. ‘If you dream it, we can create it,’ says Nino Rosella, of the Master Wishmaker, which creates bespoke interiors that are loved by adults as much as children. ‘We literally make dreams come true.’ Founded in 2011 by the architect Roger Mcintyre and the builder Sege Rosella, the company was born after a client asked for a luxury playhouse. ‘We can make anything now. If you want a playhouse as big as a mansion, made from real gold, we’ll do it,’ says Rosella. Most projects start at 10k, but a 29-year-old client recently spent several million on a pirate hide-away called Challis Island, on a lake near Cambridge. The lake was drained in order to create the island, and then refilled. The result is an adult playground on the most preposterous scale. The process of building fantasy worlds is lengthy and technically complex. Before a single splash of hot pink paint is slapped onto a princess carriage, or a pirate cutlass artfully arranged on the bespoke boat-shaped bed, the clients will have been extensively interviewed about their taste and hobbies. Then 3D animated computer models and technical drawings are created, and plans drawn up for lighting, access, and so on. That’s to say nothing of planning applications. The ‘Baron’s Bunk’ comprised a hand-carved plane hovering over a bunk bed, complete with slide and fully lit, two-storey air traffic control station. The Master Wishmaker’s playhouses are more extravagant, and they’re in the process of making a two-storey tree house with cinema, hot tub and kitchen for a family in Essex. There are also plans for a 20,000 square foot tree house with ‘river’, helipad, glass-bottomed swimming pool, jungle gym and home cinema for the US luxury magazine the Robb Report. There’s certainly something bonkers, too, about building expensive, elaborate interiors that children will soon grow out of. After all, a princess suite designed for a three-year-old girl won’t delight the world-weary 13-year-old she later becomes. It brings new definition to the term ‘disposable income’, and makes one wonder who, exactly, parents are buying for when they fork out £50k for a bedroom suite. Less disposable, more heirloom, Dragons of Knightsbridge have been creating bespoke painted interiors for 30 years. Gwyneth Paltrow, Elton John and Madonna are fans, and they’ve recently shipped an entire bedroom to Moscow, complete with all furnishings, lighting and rugs, at a cost of over half a million pounds. There’s something so reassuring, after all, about buying into old-fashioned English style. Dragons have graced many a royal nursery. Prince George apparently has a Beatrix Potter-themed bedroom designed by them. There’s a certain melancholy in the story of the poor little rich kid who craved a real puppy of her own. The globe-trotting existence of her super-rich parents made this difficult, so instead they ordered from Dragons full sets of puppy-decorated furniture for the nursery of each of their houses around the world. The understatement only goes so far: one of their bestselling items is the Little Duchess upholstered cot, coming in at a cool £12,000, with French silk drapes and cut-glass diamante padding. All this seems rather modest compared with America, where Beyoncé spent £400,000 on a solid gold Ginza Tanaka rocking horse for her baby daughter Blue Ivy. 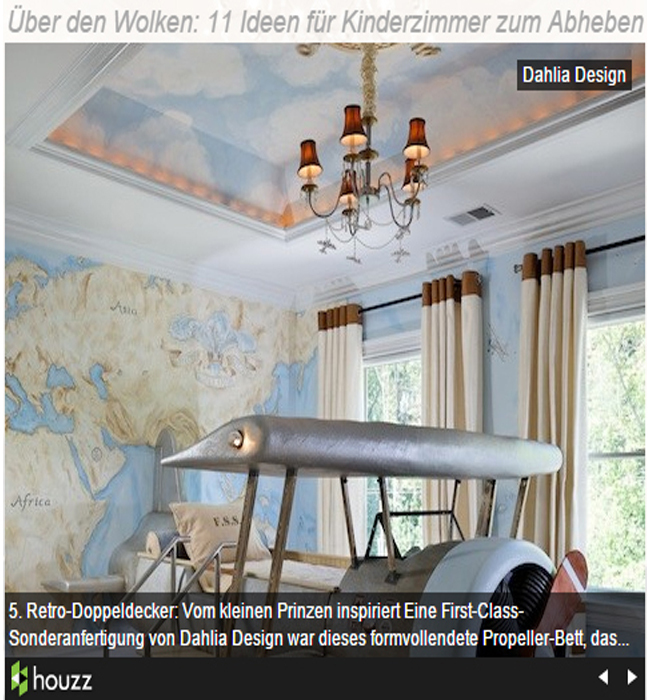 The interiors company Dahlia Designs recently created a 5,000 square foot playroom, decorated with all sorts of themes, including space, safari, aviation and princess. ‘It was wild, and we really went to town on the special effects. There was a games area with hi-tech toys that would pop up. We created something beyond most people’s wildest imaginations,’ says director Dahlia Mahmood, who runs the company from LA and Washington DC and has a (highly confidential) list of movie star clients. The playroom cost a million dollars, and took a year to complete. The US tendency to spare no expense when it comes to indulging children is being imported to Britain. Baby showers, if they happened here at all, used to involve a few friends getting together for tea and cake to give the expectant mum some muslin squares and a nursing bra. Today, extravagant themed parties are becoming common among the wealthy, with gifts running into tens of thousands of pounds. Leading the field in bringing this LA trend to Britain is Gigi Brookes, whose clients are described as high-net-worth individuals. Much of their more extravagant pieces are manufactured in America, and while they can create a nursery with a budget of £5,000, many clients will be working with ten times that amount. Recent projects include a bed inside a huge dragon, a play car made from real car parts, and a navy and gold nautical nursery with a crystal ship chandelier. Their woodland-themed nursery for Leah Wood featured heavily in Hello! magazine. ‘The internet has opened up a giant look-book for parents, and we’re seeing a demand for highly creative design spilling beyond bedrooms and playhouses into special events for children,’ says Ali Lovegrove of Gigi Brookes. The company created a week-long Wild West camp for a child’s birthday party, with handmade tents painted with western themes, and an old-fashioned general store where the children could spent tokens they won on toys and sweets. No detail was overlooked, from the wicker shopping baskets to the open fire where the kids cooked marshmallows every night. ‘Our designs really help stimulate creativity, and all our clients are focused on encouraging their children’s creativity,’ says Lovegrove, without a hint of irony. I’ll never have these sort of sums to spend on my children’s bedrooms, but it’s not just sour grapes that leaves me with the sense that the world of the imagination can’t be bought. Benign neglect, and allowing children to get thoroughly bored to encourage them to dream, can work magic. If you really want to push the boat out, read them Lewis Carroll, then drape a blanket over a bunk bed and leave them to it. Princesses have long enchanted little girls. But cultural flash points in recent years have fueled demand for increasingly elaborate—and expensive—fantasy rooms. Upstairs are the girls’ royal bedrooms, in which Stella sleeps in a $6,000 custom-made castle bed, and Presley’s pink-and-white striped wallpaper is illuminated by a crown-shaped chandelier. Princesses have long enchanted little girls. But cultural flash points in recent years, such as Disney ’s blockbuster “Frozen” and Prince William’s royal wedding, have fueled demand for increasingly elaborate—and expensive—fantasy rooms. Enjoying the spoils are interior designers who specialize in decorating kids’ ultimate bedrooms. Specialty furniture companies deal in lavish royal-boudoir accouterments, from $3,000 Cinderella lamps to $35,000 carriage-shaped beds. As the style becomes more popular, more mass-market companies have rolled out crown-shaped cornices, tulle canopies, and Rococo children’s furniture. An inevitable change in a child’s tastes can be a concern for many parents and designers. Bronson Trebbi, chief executive of a business-services firm in Cincinnati, balked when his interior designer suggested a princess room for his two toddler daughters, now 5 and 8, who divide their time between his home and their mother’s. “I just wanted to do something that would give them a sense of identity and excitement and to create a place for their imaginations” in his Mount Lookout, Ohio, home, Mr. Trebbi said. The palace look seemed risky, he said, because the girls could quickly outgrow it. But his designer, Cincinnati-based Laney Reusch of Reusch Interior Design, felt certain it was the right approach, she said. “I have a daughter and two stepdaughters. I know girls,” Ms. Reusch said. To assuage Mr. Trebbi’s concerns, she bought a $3,000 bunk with castle-shaped cloth panels that can be removed if the girls outgrow the look. A petite, custom sofa and customized chalk board make a schoolhouse nook suitable for both princesses and commoners. The room, which cost $10,500, has become a draw for the girls, Mr. Trebbi said. Teenagers and little boys have also inspired royal boudoirs. Evelyn Miller, an interior designer who lives in Oyster Bay, N.Y., built a nearly $100,000 princess room for her daughter, Siobhan, who was 17 at the time. The idea came from a picture of a room in an Italian palace that Siobhan spotted in a fashion magazine. “I said, ‘I know it can’t be exactly like this,’ ” said Siobhan Miller. “But lo and behold, I got a palace. It is exactly like that room,” said the 22-year-old marketing analyst, who now lives in New York City. To achieve the look, the elder Ms. Miller, owner of Evelyn M. Designs in East Norwich, N.Y., bought a $15,000 antique armoire, a Nepalese silk area rug for $5,000, and painted the walls the exact shade of blue in the magazine photo. Ms. Miller said she was partially motivated by wanting to build up her design portfolio, a strategy that has paid off. She is currently creating a nearly identical room for a client who saw pictures of her daughter’s room, she said. Gwen Urs turned to a nursery specialist in 2012 when she was about to give birth to her second child. Eager to maintain the surprise of the baby’s gender, she asked Sherri Blum Schuchart, owner of Jack and Jill Interiors in Gardners, Pa., to design two nurseries: one for a baby princess and one for a little prince. To keep the secret safe, Ms. Urs and her husband sent the baby’s gender-identifying ultrasound straight to the designer without ever looking at it themselves. Disney, which rules the princess market, is expanding its princess décor. This year, Rooms to Go, a furniture retailer that licenses the Disney name, is adding 15 new items to its Disney princess collection, said a spokeswoman for Disney Consumer Products. The company sells princess bedroom sets that cost between $500 and $2,000. This year, another licensee will introduce a $380 carriage-shaped princess bed at Toys R Us. Zoya Bograd, a furniture retailer and interior designer in New York, sells high-end children’s bedroom items such as $60,000 Murano-glass chandeliers and $10,000 to $15,000 custom carpets. Her company, Rooms by Zoya B., organizes furniture into rooms named for princesses from art and literature. She has the Aurora room, anchored by a $6,800 crib; the Ariel room, which features a $5,755 seven-drawer dresser; and the Sleeping Beauty room, with a $3,945 glass chandelier. The popularity of the princess look belies the anxiety parents feel over fulfilling their daughters’ fantasies. Jason Hulfish, a Tampa-based artist who is creating the Dickhouts’ California playroom, said he begins each project by interviewing the parents and child. One exception is Ms. Dickhout. Did you hear the one about the princess and the playroom? It may seem like something out of a fairytale, but posh parents who are prepared to do anything for their little girls are splashing out to recreate something out of their wildest dreams. It doesn’t matter that the children are barely out of diapers, obsessed by all-things Frozen and perhaps even the Royal Wedding, youngsters simply love the opportunity to play princess – every day. The price tag alone seems more akin to that of a royal palace. 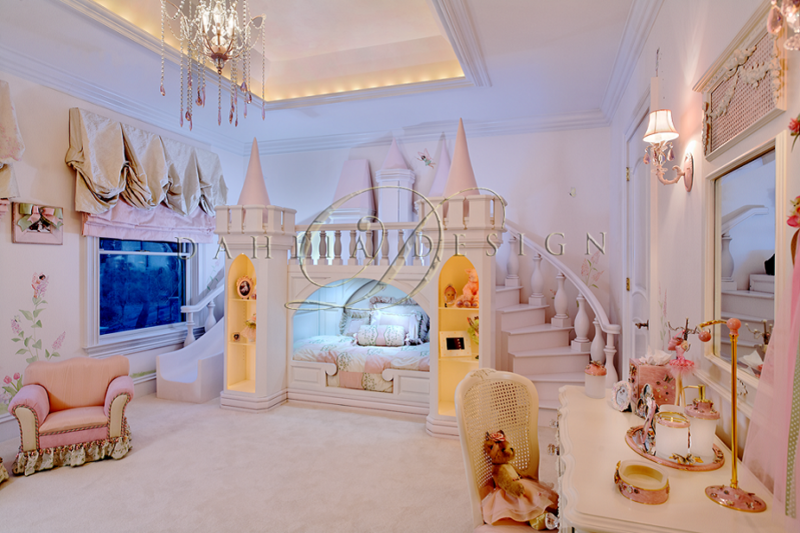 One princess-themed playroom created by Dahlia Mahmood of Dahlia Design costs a cool $70,000. Designed and constructed for Stella who is four and Presley who is two, the room comes with a faux gem-encrusted performance stage, a treehouse loft, and a mini-French cafe, all lined with a $20,000 carpet. The girls will sleep in bedrooms fit for royalty including a $6,000 custom-made castle bed. ‘It’s going to be a pink explosion, with hearts and bows and crowns and tassels,’ says their mother, Lindsay Dickhout who is the CEO of a tanning product company. Cinderella is predicted to be one of the year’s most successful movies and like Frozen it’s believed that its merchandise could be equally as successful, raking in hundreds of millions of dollars for Disney in the process. Such royal tastes have also boosted demand for increasingly elaborate fantasy rooms. Designer Dahlia Mahmood says that costs is simply not a barrier for many of her clients. ‘If Walt Disney could create something that is so unique and is appreciated by both adults and children from around the world, then I can do it too. Ms Mahmood specializes in decorating kids’ ultimate bedrooms and deals with specialty furniture companies that area able to create virtually any accouterments to fit their clients tastes with everything from $3,000 Cinderella lamps to $35,000 carriage-shaped beds. Ms Mahmood says she created a $200,000 princess-fairy themed room for a two-year-old girl in Virginia five years ago which included a castle-shaped bed complete with turrets for her toys. Even the bathroom walls were coated with Swarovski crystals. Just two years later, when the girl was 4, Ms Mahmood was invited back for a redesign. After all, the little girl had begun to grow up and her tastes had matured. ‘Every aspect of our design is carefully chosen for its details and timeless qualities. We will not settle for less and we do not expect our clients to be satisfied unless we are,’ she says. Of course, getting the princess look doesn’t have to cost tens of thousands of dollars. A number of companies produce princess-like items at a fraction of the price. Pottery Barn Kids introduced tufted headboards and tulle canopies two years ago and unicorn bedding last year. This year they introduced sparky chandeliers. Restoration Hardware has created a princess-like 19th-century Rococo bed from France which costs $1,300. Disney has a room-desinging arm called Rooms To Go which offers a Disney Princess collection with bedroom sets costing between $500 and $2,000. Toys R’ Us is introducing a $380 carriage-shaped princess bed, however another company called PoshTots sells items at the top-end of the market including a $35,000 princess carriage bed. When it comes to indulging in that princess fantasy, some parents will stop at nothing to ensure their daughters wishes are fulfilled, and with tales as old as time, it doesn’t look as though it is a trend that will disappear any time soon. The new year is often a time of change and an opportunity to start anew. The three ways you can update your home in honor of the new year is to change your look, to reorganize, and to make simple home improvements, all of which can make your lifestyle easier and bring value to your home. Changing the look of your home can be as simple as applying a new coat of paint—an easy change that could make a world of difference. You can reorganize by getting rid of things you do not need. Less clutter will minimize stress and give your home a clean and tranquil feel. We are always encouraging our clients to invest in their homes, whether it is in updating a kitchen or bathroom, expanding a space to add more square footage, or façade-remodeling to add curb appeal. Starting off with any of these changes not only adds value to your home, but also gives you a fresh start for the new year! What are a few home decor-related New Year’s resolutions you’d suggest readers to strive to achieve in 2015? When it comes to giving your home an elegant interior, it is all about the details. Changing accessories is the quickest way to change the look of the home for the New Year. Throw pillows, for example, brings instant gratification and is an exciting face lift for the home. Enhance your space with little details, such as changing your hardware. This is a small investment that can really update the look and feel of your home. Changing light fixtures can really dress up a room by bringing new dimensions to the space, creating a new spark of interest. Only fill your home with things that will make your heart skip a beat for years to come. Happy New Year! Dahlia Design embodies sophistication and innovation. This sensibility is reflected in the work of principal Dahlia Mahmood and her staff of craftsmen and designers, who combine the elegant forms of classic architecture with transitional elements to create simple yet glamorous interiors. Dahlia develops a style for a client through careful listening. “Before I start, I ask the client’s likes and dislikes and what they envision for the space,” she says. “I ask about their daily lives and map out a floor plan that flows with the structure of the family. Residential design is much more than decoration; it is creating a lifestyle and a functional space in which the client feels at home. Dahlia Design received an NKBA Award of Distinction for Large Kitchen in 2013. What is the key to a successful interior design project? The key to a successful design project is chemistry between the people working together. Because interior design tends to become very personal, it’s important to be able to comfortably communicate your ideas or concerns with one another. As with any relationship, however, the most vital characteristic is trust. A successful project is a product of good collaboration between client and designer. What is one important mistake many interior designers make? How have you overcome/avoided it? All interior designers are familiar with the occasional favors dropped on our shoulders by friends and relatives for casual consultation and gratuitous interior design services. Although it is great to help out others to a certain extent, it’s also important to priorities and avoid taking away time and energy from career building projects. No matter how you express your over flowing schedule, no one but a fellow interior designer will understand the amount of work that actually goes into the business of design. The most difficult discipline is teaching yourself that your time is valuable and sometimes it is okay to say no. Interior designing for others has shaped your career. How does your design aesthetic appear in your own home? Are you as passionate in designing your own personal spaces? When designing my own home, I become my own worst client. Working with the newest trends and styles every day, I cannot help but to incorporate my favorite finds into my personal interiors. Because I’m constantly changing my own space, I’ve designed my home using a light and neutral color palette to serve as an elegant backdrop for new pieces of art, furniture, and accessories introduced to my home. A constant accessory in my house, however, is a bouquet of fresh flowers. No matter how busy I get, I will always make time to pick up bundles of white lilies to arrange throughout my home at the beginning of every week. Fresh cut flowers are delicate expressions of life and bring in a sense of renewed creative motivation. Learn more about Dahlia Design at their Haute Residence profile and website. Sugar, spice and everything nice was the inspiration behind this little girl’s dance-inspired bedroom by designer Dahlia Mahmood. When it came to designing a bedroom for a young girl, designer Dahlia Mahmood incorporated all things feminine to give it an elegant touch. A stunning chandelier, four-poster bed and soft pink details throughout the room are just a few of the design choices that make this room a knockout. What were the main items on the family’s wish list? The family requested a graceful design, for their two-year-old daughter, with a playful ballerina theme. What was the single largest challenge you wanted to address for this client? The design of this room was kept simple. There were no real issues, but intent to design classic and elegant forms, which would extend the lifespan of the space. The child should be able to grow into the room without much modification in the future. What was your biggest obstacle in this space? The only major challenges came with the design of the bathroom. The pre-existing plumbing did not match up with the new waterworks fixtures. The connections had to be custom made to fit. How does the end result match up with your original vision for the space? With the intentions of keeping the room very simple, we wrapped the walls of the bathroom with a pink beaded wallpaper, then hung a simple mirror framed in crisp white panels. Putting the rest of the bathroom together, we decided to push it a step further and ornament the mirror with pearls and gems, classic elements to enrich entrance to the bath. Seeing it as a whole, the bathroom became a jewel itself. Using an airplane bed as her centerpiece, designer Dahlia Mahmood relied on creative design elements to create this eclectic kids’ bedroom. The room was designed for a little boy, whose father has a love for flying. In hopes that his son would follow in his footsteps, he asked for a room that would inspire a curiosity in aviation. Almost every concept is too large for the actual space. After all, how can the vastness of the sky be recreated in a bedroom? Designing children’s rooms, however, is a chance to imagine wildly without the consequences of it being over-designed. The murals hand painted on the walls create an illusion of depth without taking up any space at all. Designing this bedroom, we came across the classic form vs. function issue. Much of this room was designed for aesthetics and dramatic effect, but we also wanted it to be practical for the child as well as his nanny. Designing the jet, we envisioned a grand form jutting out of the wall. Building it, we realized that the wings and propeller could potentially become an obstacle. So we softened the design, reshaping the wings and propeller to be short but not stumpy. As a designer, I am very detail oriented and tend to be involved with every aspect of a project. Last year, I was pregnant with my second son and was forced to be on bed rest during the middle of an installation. For the first time I had to step back from a project and resist the impulses of a perfectionist. Although I was concerned, in the end, the project was completed beautifully. I learned that sometimes its okay to delegate, even from a hospital bed, and allow myself to take a break. Designing a home becomes very personal and a good client-designer relationship requires chemistry. My work always consists of the best value, meaning that we don’t cut corners and every detail is carefully considered. I design toward simplicity and elegance, integrating the timeless qualities of classic design with contemporary sparks of interest. This season I’ve been inspired by the soft pastels and vibrant, bold colors of spring, especially the corals. Most of my work consists of neutral tones and metallic accents; and shades of coral offer a pop of interest on a subtle color palette. To learn more, visit Dahlia Design’s Haute Design Network Profile. That was in 2011—the year Butler began playing for the Los Angeles Clippers. Prior to heading West, he spent a year with the Dallas Mavericks, where he won an NBA championship, and five years with the Washington Wizards, where he became a two-time NBA All-Star. Though the family would now have to spend much of the year in California, they decided to keep their residence near DC and tasked Mahmood with re-designing it while they were away. While the home’s exterior is traditional, Mahmood went for a glamorous and younger, more transitional look inside. She selected a light, buff palette dressed up with gold, bronze and silver accents. Metallic faux treatments, textured wall coverings and custom crystal applications add subtle sparkle and shine—effects that Andrea Butler adores. One challenge the designer faced was choosing furniture that would be comfortable for both six–foot, seven-inch Caron and five-foot-tall Andrea. In the living room, she found both proportion and style with Barbara Barry’s latest collection for Baker. Light plays off metallic striae on the walls, a silver leaf treatment on the ceiling and shimmery Donghia fabric on the sofas. The dining room is equally opulent. An intricate crystal chandelier, walls stenciled to complement the Zimmer + Rohde drapery fabric and a Barbara Barry sideboard in a silver-leaf finish create an elegant look. Large Bill Sofield host chairs paired with Barbara Barry X-back chairs “play on the masculine and feminine,” Mahmood says. Also on the main floor, Butler’s home office centers on a custom Baker desk. On display are prized photos, trophies and a framed copy of Theodore F. MacManus’s “The Penalty of Leadership,” which means a lot to Butler. “The text describes how you can’t let the negativity of a jealous individual affect your path to greatness,” he explains. Photographer Bob Narod is based in Herndon, Virginia. INTERIOR DESIGN: DAHLIA MAHMOOD, Dahlia Design, Ashburn, Virginia. The floors, tub surround and his-and-hers vanity tops are Carrara marble. Custom cabinetry perfectly fits the space, and elaborate custom millwork embellishes the walls and encases the Kohler whirlpool tub. Adorning the half-moon bank of windows are lush draperies in a satin/cotton blend from JK Drapery, paired with a layer of sheers that allow for privacy while admitting natural light. INTERIOR DESIGN & CONSTRUCTION: DAHLIA, Dahlia Design LLC, Ashburn, Virginia. 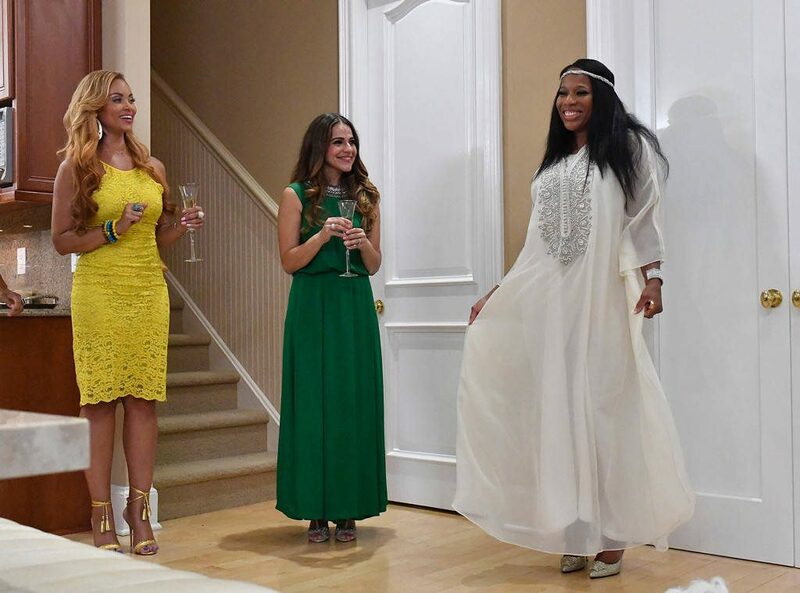 Put the bubbly on ice because Charrisse Jackson-Jordan is finally ready to take us inside her brand-new champagne room!The Real Housewives of Potomac star welcomed E! News into her home for an exclusive tour of her new sinfully stunning sanctuary ahead of the room’s debut on this week’s episode of the Bravo hit—and the remodel does not disappoint. But don’t just take our word for it. Get a sneak peek in the video above and see for yourself!